Join Hello Buffalo! 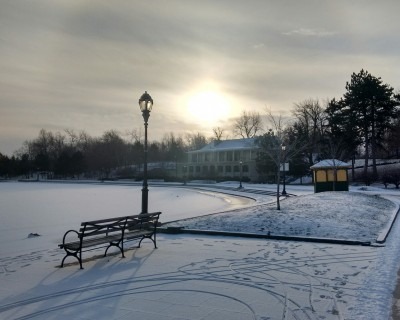 Urban Hikes & Bikes for an enlightening and energizing hike through Delaware Park in winter! See it like you’ve never seen it before! We actually hope it snows! The serenity and the beauty of the park in winter will amaze you! Come hike with us and see the park from a whole new perspective! Experience what Frederick Law Olmsted designed our park system to be. He is considered to be the father of American landscape architecture. Come and see why! Even if you frequent the park, this is a great chance to see things you’ve never noticed before and maybe even learn something about our city! Come and criss cross the Delaware with us! We’d love to have you! We meet on Meadow Drive at the tennis courts closest to Amherst Street at 8:45am. You can access Meadow Drive from either Parkside Avenue or Colvin Avenue. Parking is available along Meadow Drive between the Buffalo Zoo and Ashkers in the Park. Please wear comfortable shoes and dress for the weather as we’ll be spending two hours or more hiking the park!